Situated by the sea, this lodge is within a 15-minute walk of Myall Lakes National Park and Tomaree National Park. Dutchies Beach is 1 mi (1.7 km) away. 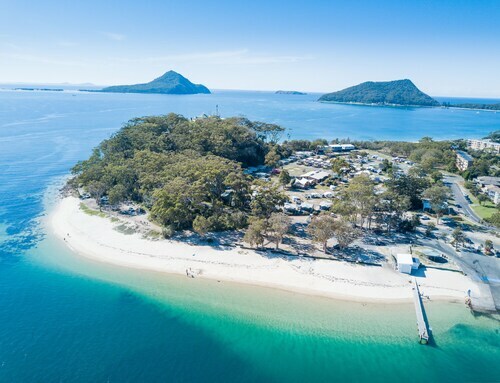 Nelson Bay is the main town in Port Stephens, a NSW beach haven with 26 beaches. The diving and snorkelling is incredible, but there are also calm, family-friendly spots for safe swimming or sailing. You can watch whales, spot a porpoise or two, wander Tomaree National Park, sip coffee by the seaside, or hop across the Bay to Hawks Nest. Wot more could you want from a beach holiday? Choose from our range of Nelson Bay hotels and all you'll need to remember is to pack your swimmers and sunscreen. In the early 19th century, a group of Chinese fishermen established a base at Nelson Bay and sent their catch back home. The town was first surveyed in 1874, and in 1882 Captain John Dalton built a house on the hill overlooking the town, calling it ‘Westward Ho’. Fly to Fly Point, where you can dive into the water and meet and greet an octopus or wobbegong. You’ll also spot fish, sea spiders and other little critters swimming around the coral. On nearby Broughton Island, you can go through the Looking Glass! Here, the Looking Glass is a stretch of sea that runs through the middle of the island. Unlike Alice, you’ll have a snorkel or a scuba suit – and there isn’t a rabbit hole in sight. There is a wonderland, though: grey nurse sharks, eagle rays, gropers and morwongs have been seen swimming among walls of rock. You can only get to Broughton Island by boat, but even the journey itself is beautiful, with sea cliffs and dolphins along the way. If you’d rather stay dry, but don’t wanna miss the marine life, take a whale watching cruise. If swimming is on your agenda, there are plenty of options in Nelson Bay and Port Stephens in general. Nelson Bay Foreshore is a nice place for a paddle, and also for festivals like the wine and craft beer-filled Tastes at the Bay Festival. If you’re after something more adventurous, feed a shark or stingray at the Australian Shark and Ray Centre, which is open seven days a week. Wade out and feel the adrenaline as a 3-metre shark rubs past you, searching for food. Spend some time at Tomaree National Park, where you can explore deserted beaches and coastal forests with koalas and wildflowers. If you’re into surfing or kite surfing, the best waves can be found across the bay at either Windy Woppa or Jimmy’s Beach in Hawks Nest, where you can also go kayaking or sailing on a catamaran or Hobie Cat right off the beach. If wine is one of your passions, head to nearby Bobs Farm, a small suburb in Port Stephens and visit the Nelson Bay Winery and Murray’s Brewery, or tuck into the olives at Sams Fig and Olive, where you can pick up some beautiful and tasty olive oils, tapenades and fig jams. Nelson Bay has seafood restaurants by the sea, Chinese restaurants in the town centre, and cafes all over the place, including one inside the Nelson Bay Lighthouse. Take a walk in the town centre and you’ll find dive shops, surf shops and fashion boutiques. Nelson Bay is a one-hour drive from Newcastle, and we have flights to Newcastle to get you there for less. 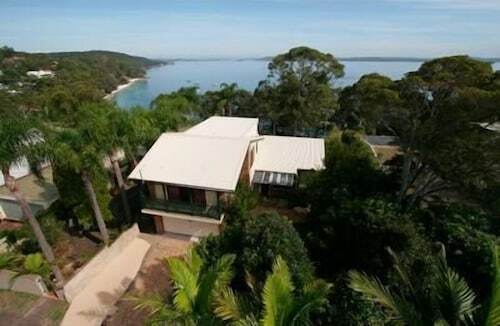 Check out our range of Nelson Bay accommodation to be the star of your own Baywatch! How Much is a Hotel Room in Nelson Bay? 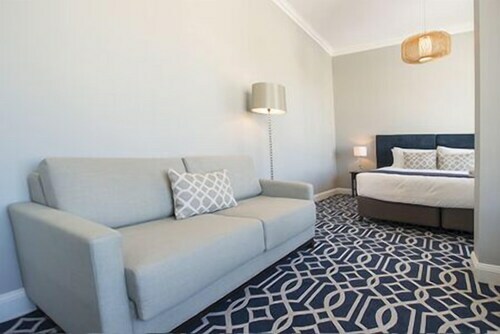 Hotels in Nelson Bay start at AU$100 per night. Prices and availability subject to change. Additional terms may apply.